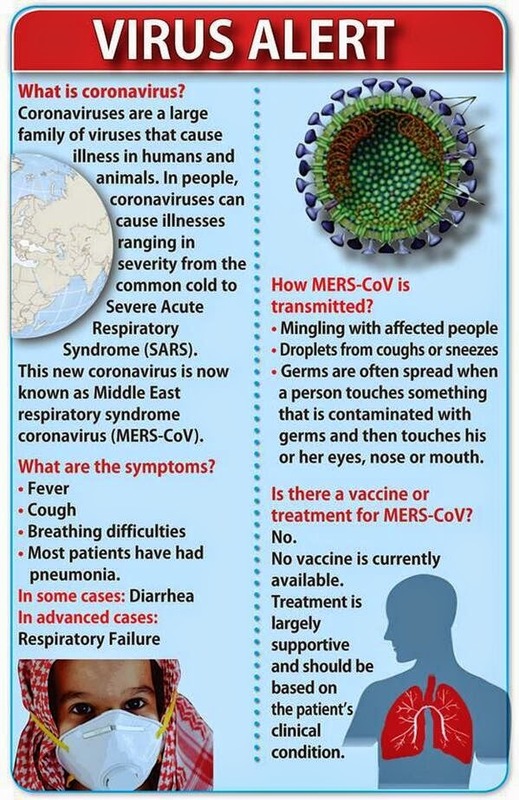 Manila, Philippines - Overseas Filipino worker (OFW) who recently arrived in the country for the Holy Week was tested positive for the deadly virus Middle East Respiratory Syndrome Coronavirus (MERS-CoV). The Department of Health (DOH) on Wednesday, April 16, 2014 confirmed that the said OFW is asymptomatic. The agency did not announce the name of the suspected carrier of the highly fatal disease. In medicine, a disease is considered asymptomatic if a patient is a carrier for a disease or infection but experiences no symptoms. "This OFW, a health worker, had personal contact with a confirmed MERSCoV patient and came home for the Holy Week. ", DOH said in a statement. Last April 11, 2014, the United Arab Emirates (UAE) Ministry of Interior reported the death of an Overseas Filipino Worker (OFW) allegedly due to MERS-CoV. While the WHO Country Office in Manila has yet to confirm this case, the Philippine Ambassador to the United Arab Emirates Grace Relucio- Princesa has received confirmation from National Health Authorities in UAE. The Bureau of Quarantine (BoQ) is already alerted just in case the remains are brought back to the Philippines. If this case will be confirmed, this will be the second time a Filipino died of MERS-CoV in the Middle East. Last August 29, 2013, a 41 year-old Filipina nurse also died of severe MERSCOV infection in an undisclosed hospital facility in Riyadh, Kingdom of Saudi Arabia. Her embalmed body was repatriated and brought home in a hermetically-sealed coffin for final interment last November 2013 without the need for special precautions. The Department of Health (DOH) is also verifying the report that five other Filipino workers in Al Ain City in UAE were quarantined after routine contact tracing. DOH through the National Epidemiology Center said that the OFW is the husband of one of the quarantined OFWs in Al Ain had visited his wife and returned to the Philippines last April 6. The husband is in home quarantine and so far has no signs or symptoms of disease. As of April 13, 2014, the World Health Organization (WHO) has reported a total of 228 laboratory-confirmed cases of MERS-CoV infections with 92 deaths from 10 countries, mostly from Saudi Arabia and Qatar. DOH is sending an epidemiology expert and an infectious disease specialist to the United Arab Emirates (UAE) to assist overseas Filipinos following the report of a death from MERSCoV. Meanwhile, DOH Assistant Secretary Eric Tayag on Twitter compared the spread rate of MERSCoV to SARS: "Between 2002 and 2003, 10 out 100 SARS cases died; from March 2012 to Apr 13, 2014, 40 out of 100 MERSCOV cases died but SARS spread faster." "The Philippines and Malaysia are 1st two countries in Asia outside the Middle East with laboratory confirmed. Malaysia also reported their 1st case of MERSCOV who died last April 13 according to local media and is claimed to be the 1st in Asia. ", Tayag added. The Philippines is the 12th country and first in Asia outside the Middle East with laboratory confirmed MERSCOV case. The DOH reiterates its advice to OFWs who have respiratory illness to see their healthcare provider and mention their recent exposure or travel while the Bureau of Quarantine strengthens its monitoring of all incoming passengers in all ports and airports. 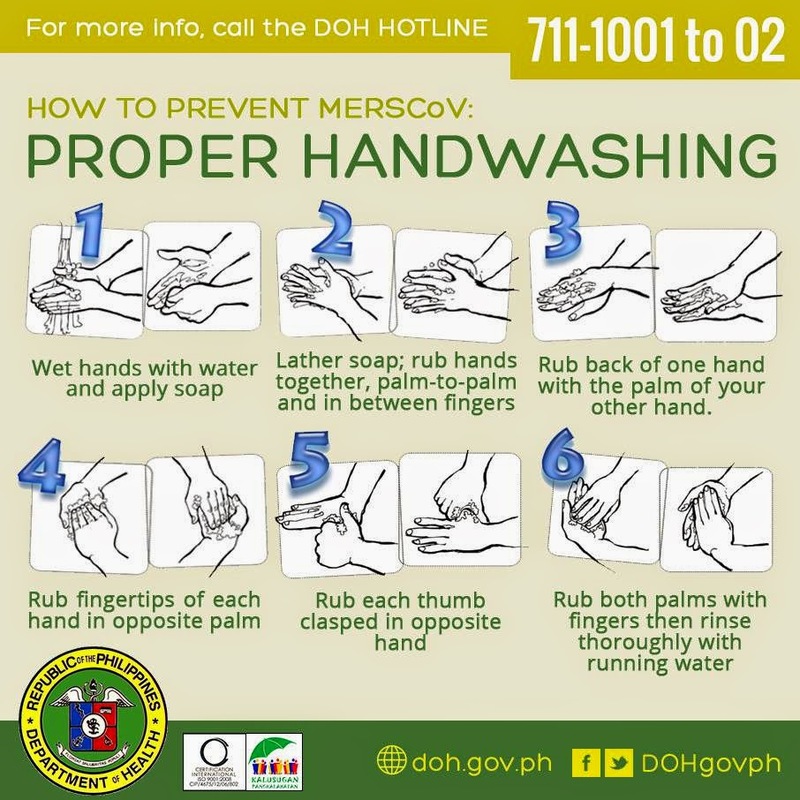 The public is reminded to observe proper cough manners and frequent handwashing. The Middle East Respiratory Syndrome Coronavirus (MERS-CoV) is a highly fatal respiratory illness presenting as an influenza-like illness characterized by fever, cough and often with diarrhea. There is limited data on its transmission but possibly through direct contact of household members and health care providers exposed to confirmed cases. Source and transmission data remain limited though. The diagnosis is made through serology and/or DNA tests and the treatment remains supportive.